Without much doubt this book has to be one of the best cricketing autobiographies I’ve read. Filled with so much drama and opinion Warne goes into detail about the Aussies success, his captains and his own fantastic achievements. He also talks about the people he doesn’t get on with that much. 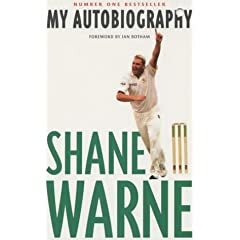 It’s filled with praise for the greats of Australian cricket and others from around the world.. It’s a great read for any Shane Warne fan or even any cricket fan. Mike Atherton was England’s captain when they were at their worst; during the 1990’s. Like few before him who played in that era Atherton has come out with a fascinating diagnosis of his own cricketing life and that of the team’s. It’s no mystery that England were bad during the 1990’s. The gap between county cricket and test level was massive and there seemed no way of bridging the divide. Most new batsman who came into the side couldn’t make the step up and while this transitional period was going on English cricket was suffering. Now a cricket commentator and writer Atherton seems a lot more relaxed and calm. Atherton’s approach is brilliant. He writes about his time at Cambridge University, his times prior to England call up playing for Lancashire and the core piece his time as England captain. He also vaguely touches on playing for England without the captains responsibilities. There’s not much more you can dissect from the 1990’s English cricketing period than what’s in this book. The dirt in the pocket incident, retiring Hick on 98 and his duel with Donald all feature in this fantastic read.